Journal : Practitioner ; vol. xliii., July. London : Macmillan and Co., 1882. Description : -3 p., [1 l.] pl. ; ill.: 2 phot. ; 22 cm. Photographs : portraits on one leaf, before and after treatment. Subject : Skin — Hypertrichosis ; treatment. Author caption: By Author Jamison, M.D., C.M., London. Medical degree, Glasgow University, 1864. Private practice, St. Helens, Lancashire, 1866-87. Private practice, Belgravia, London, 1888. Fellowship, Royal College of Physicians, 1889. 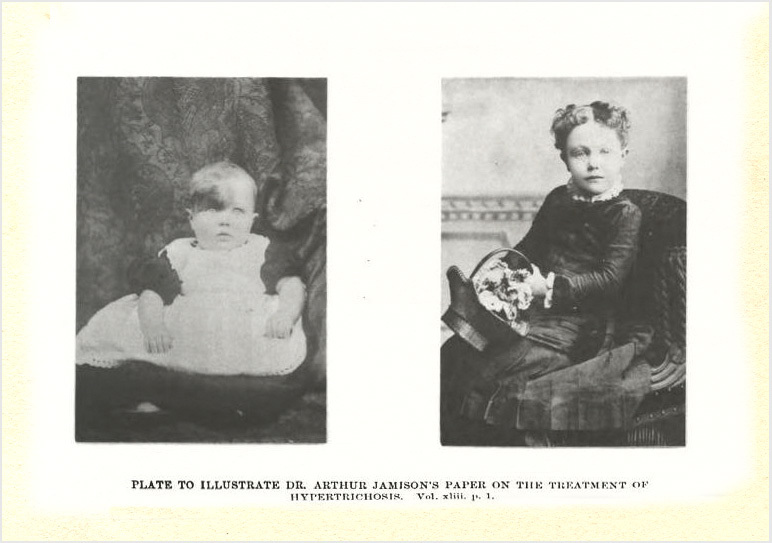 Photo caption: Plate to illustrate Dr. Arthur Jamison's paper on the treatment of hypertrichosis. Vol xliii. p. 1. Photos published in the following number. The child, a healthy girl, is now over six years old, and the second illustration, which is from a recent photograph, shows her present appearance. Her mother writes to me that there is now no disfigurement, the skin hairless, smooth, and nice-looking, but I think the picture speaks for itself.—Page 3. Through a very unfortunate mistake of the binder, the photographs now given with this note were not, as they ought to have been, inserted in last month's Practitioner with my article on "The Treatment of Hypertrichosis." I hope, however, that all who have been good enough to read tliat paper will glance at the accompanying illustrations, and that those who now notice them in this number will refer to the Practitioner for July, for the details of the method by which the removal of this large overgrowth of hair was effected by the use of ethylate of sodium. Briefly I may state that the first photograph represents the child's forehead before treatment, covered for more than half its extent with long hair, the second one the result of the method adopted for its removal.—Page 81, August number. Jamison photographed his three month-old subject before treatments of caustic sodium ethylate. The second photograph shows the child at age six, entirely clear of her congenital hypertrichosis. Jamison contributed a two page article on the use of sodium ethylate on hairy moles in the following number of the Practioner.